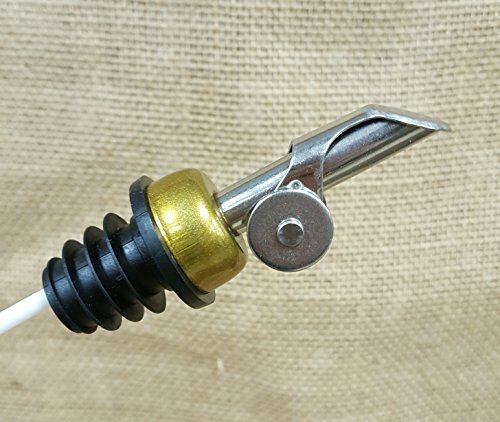 Set of 2 Stainless Steel / Gold Premium Weighted Olive Oil Pourer with Flap w/Signature Picks by Happy Hour Supplies at Verve Wine Bar. MPN: AMP102SY. Hurry! Limited time offer. Offer valid only while supplies last. Classy and Elegant. Stainless Steel and Gold with weighted lid. Will fit most standard bottle necks including wine bottles, liquor bottles, oil/vinegar sets. Lid opens and closes to protect contents from bugs and dust. If you have any questions about this product by Happy Hour Supplies, contact us by completing and submitting the form below. If you are looking for a specif part number, please include it with your message.